Steel Building Projects specialise in the manufacturing, design and erection of high quality steel structures to any specifications required by you. Quality is of the utmost importance to us and all products are supplied according to the highest quality standards. All our buildings are manufactured using only high quality S355JR section steel for all components, such as; rafters, gussets, columns, cantilever sections and so on. Since IBR was introduced to the South African market in 1958, it has become the most popular sheeting used in the construction of commercial and industrial buildings. "IBR" is an angular trapezoidal fluted profile sheet. Its bold appearance makes it both attractive and practical. IBR is an abbreviation for Inverted Box Rib. The general shape and appearance of the trapezoidal flutes ensure that "IBR" is totally acceptable for use as roof and wall cladding. The deep and broad flutes of the "IBR" Type sheeting ensures excellent drainage characteristics, another characteristic that makes it an ideal sheet for roofing applications. "IBR" offers optimum strength to weight and is designed to provide the most advantageous load/ span characteristics consistent with economy. "IBR" offer the end user the option of having strengthening ribs in the sheet which help to remove oil canning from the broad flute. "IBR" can be factory cranked, curved and Bullnosed to a wide range of radii (see Bullnosing). Widedek (widespan) is also an angular trapezoidal fluted sheet and is similar in appearance to IBR profiled sheeting, the difference being the cover width of the sheet, and the depth of the flutes. 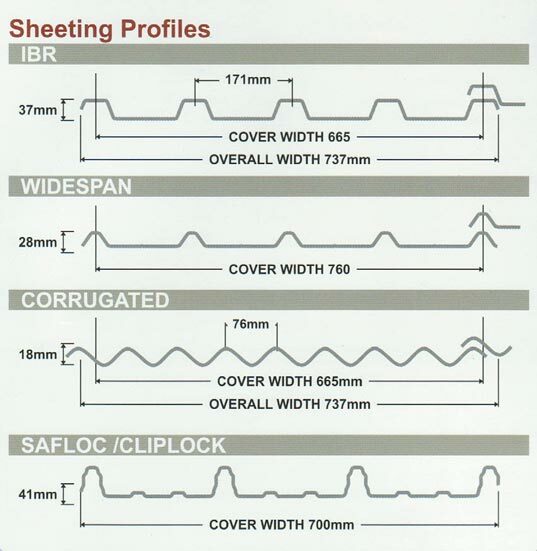 IBR sheeting has a cover width of 686mm whereas widedek has a cover width of 760mm. The depth of the flutes on IBR sheeting are normally 36,5mm and the depth of 760 is 28,5mm. Using this type of sheeting has some cost saving advantages. The 760 profile giving a better cover width means a saving of ±10% on sheeting purchased thus a cost saving. To achieve the same coverage less sheets are required to be erected, thus saving time and labour. The advantage of using 760 in place of the sinusoidal corrugated profile is in its strength, that is to say the spanning capacity of 760 are greater than the corrugated profile thus requiring less purlins resulting in a cost saving. 760 Widedek can be factory cranked, curved and bullnosed to a wide range of radii (see Bullnosing). Corrugated Profile - are sinusoidal profile sheets and can be used as roofing and cladding material. With its origins dating back to the Victorian era, its probably the most commonly known sheeting profile used in the world today. There are two sizes of corrugated sheeting on the market, 8½ Corrugated and 10½ Corrugated. The numbers 8½ and 10½ refer to the number of corrugations across the width of the profiled sheet. The two types of corrugated sheeting have different cover widths. 610 has a cover width of 610mm and 762 has a cover width of 762mm. The fact that the corrugated profiled sheeting has been around since before the turn of the century proves that this easy to use and effective method of roofing and wall cladding is here to stay. Corrugated 610/762 can be factory cranked to a curve and bullnosed to a wide range of radii (see Bullnosing). Galvanised - this is the standard silver coloured sheeting one sees all over industrial areas. Chromadek® - is available in 14 standard colours: Fish Eagle White, Kalahari Red, Kingfisher Blue, Charcoal Grey, White Lion, Buffalo Brown, Umhlanga Wave, Dark Dolphin, Sandstone Beige, Aloe Green, Azure Blue, Dove Grey, Gemsbok Sand, Traffic Green. View Chromadek® colours here. Windows - standard windows available. Our insulated panels are made of a polystyrene (EPS) insulator and cladded with 0.5mm galvanized pre-painted chromadek steel. The steel is bonded with a very strong steel 2 ply polyurethane glue. These panels are manufacture from 75mm panels up to 250mm panels, depending on your application. For packaging of the panels we use either sticky plastic film on the chromadek or bubble wrap. Only once in a long, long while will you find as much support as we offer. Give us a try; you may just experience enormous benefits.